All through the night at Lake Powell, VANilla jiggled like a bounce house full of ten year olds. Sand sprayed VANilla so hard, at times, the sound of it made me wonder if it were raining. We found no relief from the wind this morning as we headed southeast to Natural Bridges National Monument. Natural Bridges National Monument showcases three bridges; the Sipapu (meaning the place of emergence), Kachina (named for the rock art symbols on the bridge), and Owachoma (meaning rock mound). The three bridges were originally discovered in 1883 by Cass Hite as he wandered up White Canyon in search of gold. In 1904, the bridges were publicized by National Geographic Magazine and in 1908 Roosevelt established Natural Bridges National Monument, the first national park in Utah. The bridges have been subjected to several names over time. First named President, Senator, and Congressman in order of height, they were later renamed Augusta, Caroline, and Edwin by later explorer groups. When the park was expanded to protect nearby Puebloan structures, the current Hopi names were assigned to them. Sipapu Bridge, its height equal to a twenty story building and its span the length of a football field, is the second-largest natural bridge in the world. A 1.2 mile roundtrip from the parking area led down two metal stair cases, across a sandstone ledge, down three more ladders made of tree limbs weathered like drift wood, and finally through a grove of trees before hikers could stand below the bridge and stare up at its enormous arch. Beneath the bridge I met a couple from Houston. Each summer, they leave the Texas heat behind in exchange for any area above 6,000 feet. After a brief chat about our itineraries, I climbed up all the ladders and stairs to join Petey in VANilla. We made a brief stop at Kachina Bridge, the youngest of the three, before venturing to the oldest bridge, Owachoma. The 180 foot span is only nine feet thick, as is expected to be the first of the three to fall. About fifteen miles east of Natural Bridges National Monument is Mule Canyon Rest Area, where Anasazi ruins can be found. 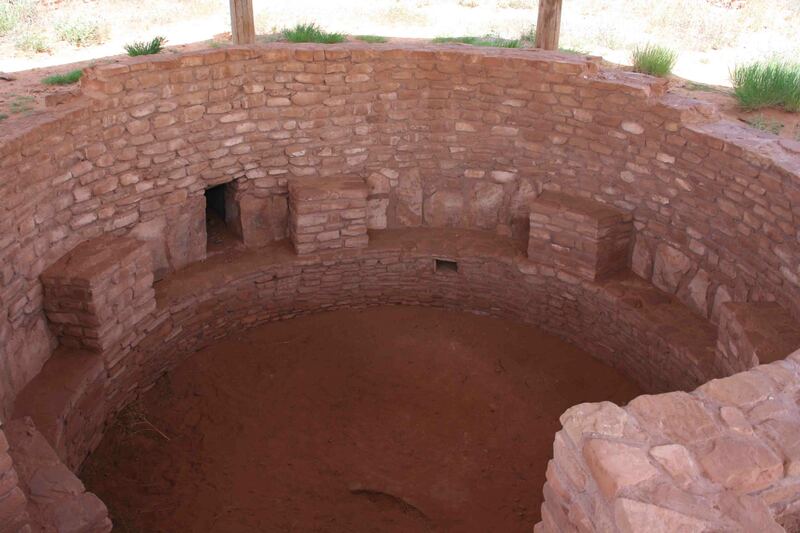 A well preserved kiva as well as additional adobe and stone structures blend in with the surrounding stone. Petey with a smiling face, bouncing ears and prancing step joined me on the short, sidewalk path that looped around the display. The natural bridges are amazing as is the Anasazi ruin. Very cool. You have certainly experienced all types of weather on your trek! Jphopefulky, the weather will be pleasant tonight and you will have a restful evening. The wind was unbelievable everywhere this weekend! Sounds like you got a taste of it too! We were in Gunnison racing bikes in the wind, not super fun. My friend was in Boulder and said she got blown off the trail twice while biking this weekend. Crazy weather!